President of the Nigerian Bar Association (NBA) Abubakar Balarabe Mahmoud has reacted to the trending story of a lawyer who passed all the necessary examinations and fulfilled all requirements, but was not called to bar earlier this week because she wore her Hijab under her wig at the ceremony. Read about it here. 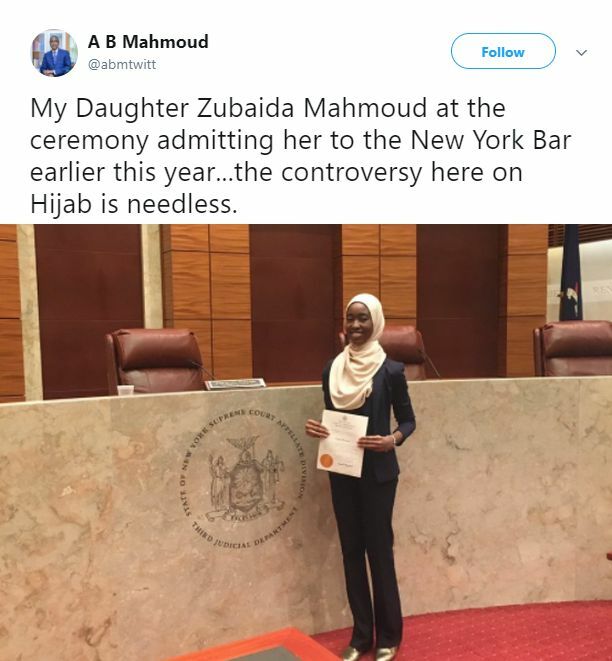 Mahmoud also shared a photo of his daughter Zubaida Mahmoud wearing her Hijab during her admission ceremony to the New York Bar earlier this year. “The controversy here on Hijab is needless,” he said. When Muslims are in positions of authourity/power, they get what they want. They change the rule of the game to suit their situation. Christians be fighting each other and sleeping on duty. Watch this Call to bar rule change. About time we do away with the sponge. Colonialism is long over. You have to understand something, in American there are no dress codes for being called to bar, but you will be allowed to wear a scarf to protect your modesty and that is far as they can allow religion to interfere with your duty as a lawyer. In other countries where dress codes are strictly adhered to, your religion will never be allowed to interfere,it’s either you conform to the rules or you walk away, so Mr Muhammad this your daughter being called to bar wearing a hijab in New York, is not a valid to buttress your argument. of course that is in New York, an environment which is as religious sensitive as Nigeria, you just have to think outside the box to get his point. 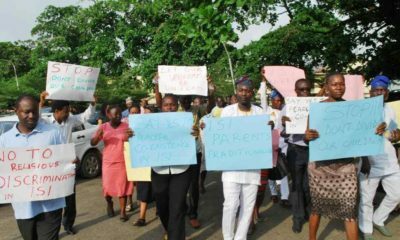 In a place like Nigeria, religion and ethnicity have always ruled not law. Do you have any idea of the number of people that voted for GMB just because he is a muslim or the number of people that want GEJ to continue as president just because he is christian…. Oh my God…..backward thinkers….once upon a time, it was a rule that blacks and whites drank from a different fountain, sit at the back of the bus and even the church……Your argument is weak and bigoted. Nigeria is an integrated society and should be all inclusive. If a rule is stupid and unproductive, it should be modified. What matters is professional decorum. How is hijab or modest dressing harming you or anyone….apart from obvious your inner bias what other sensible reason do you have?…. People are hungry and unemployed and this is the petty issue we are discussing. What a shame…. Tell the truth. Lawyers in the United States do not wear wigs. Lawyers in Nigeria and Britain do. Those are two parallels. What has the picture of your daughter and the picture of the UK based Nigerian lawyer being honored for promoting diversity in law profession.. Please, do not overstretched the truth here again. If that’s your take on this issue. Please advice the hijab wearing lawyer to relocate to the United States or other Countries to practice her law where she will not have to wear a wig in the Court room. But if she insists on practicing law in Nigeria. She must put on a wig period. That’s the dress code for lawyers in Nigeria. A word is enough for the wise. I’m just saying. What’s wrong with adjusting the status quo if it doesn’t work for everyone? I think it’s rather silly if hijab is the one thing that stops practising Muslim women from becoming lawyers in Nigeria. We should learn to be tolerant of other people’s belief and rights. This beloved dress code can be adjusted! We are a regressive country it appears. we might as well stop putting on the if it infringes on some people”s religious doctrines… a rule or law has to be fair to all sir, don”t you think…. President of the Nigerian Bar Association whose daughter was called to bar in New York. What an irony. this should be the bigger more important story. Thank you! That was the first thing that went through my mind. I don’t think the president of the Bar Association in New York would take great delight in showing pictures of his child being called to bar in Lagos or Abuja. Irony for days! The 2 important questions: Is anyone being harmed by the action? If the answer is no please don’t waste your time on unproductive issues. Im a 200 level law student in Ghana, I remember my criminal law lecturer ones mentioned that, we blacks are sooo mean towards each other and it is true. SOME PEOPLE sit somewhere and they think they can determine other peoples future by incorporating silly decisions. 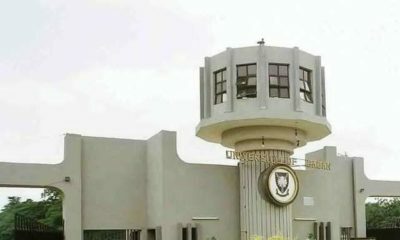 I remember some time back in gh growing up, there were issues of brilliant students who could not make it to medical school cos during the interview session they got asked if they have doctors in their families and having a doctor in your family was a determinant if u could get admitted or not. All these issues about hijab are needless as Mr. Mahomoud rightly mentioned. Its an issue of misplaced priorities. Please even the whites we always copy are accepting it and there are high court judges who wear hijabs. Please Africans lets stop being mean towards each other and concentrate on what will help move this continent forward. I noticed something about the french speaking aftican countries, they live in harmony with each other muslims and christians. 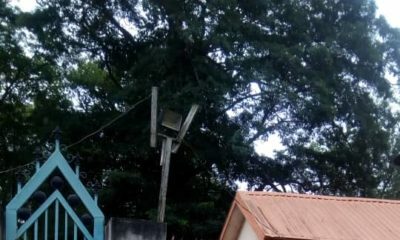 In Abidjan, there are christians who even take food to the mosques around their vicinities during ramadan, chirstians enter the mosque when their freinds are getting married. Can’t the english speaking african countries learn from them? Africa is also made up of traditionalists, atheists e.t.c.. It is not about been christian or muslim… its about adhering to the rules… there have been millions of muslims adhering to the rules why should this person’s case be different from all the muslims before her.. If you’re so worried about the African continent then christianity and islam needs to be banned.. Only traditionalism, sun worshiping and atheism should be allowed. I am more concerned about the fact that the daughter of the president of NBA is practicing law in a foreign country.. How is that pro-African? Just on your point about Christians taking food to the mosque on ramadan etc…..it’s a personal choice. To not partake in each festivities and practices doesnt mean we dont LOVE them or don’t ACCEPT them as brothers and sisters. I would NEVER go to a mosque WILLINGLY..just as i would NEVER go to A SHRINE willingly….nor will I ever carry sacrifical food there. It is a PERSONAL decision BUT doesnt take away from my ability to cohabit PEACEFULLY and LOVINGLY with them. Im a 200 level law student in Ghana, I remember my criminal law lecturer ones mentioned that, we blacks are sooo mean towards each other and it is true. SOME PEOPLE sit somewhere and they think they can determine other peoples future by incorporating silly decisions. I remember some time back in gh growing up, there were issues of brilliant students who could not make it to medical school cos during the interview session they got asked if they have doctors in their families and having a doctor in your family was a determinant if u could get admitted or not. All these issues about hijab are needless as Mr. Mahmoud rightly mentioned. Its an issue of misplaced priorities. And the fact that nigerians lawyers habe to wear this wig is just ridiculous. Then we cry wolves when we are not respected as african…the britain people have their reasons of wearing those hideous white caps..what’s yours except blind perpetration pf colonialism? can u imagine. you are the president of Nigeria bar association and u have the confidence to share a photo of ur daughter being called to bar in new york. where is the outrage? where is tge backlash? he should be removed because of this. nigerians u guys need to open your eyes. this people are cheating u guys and are boldly rubbing it in ur faces. Bruno please stop trying to sway this conversation away from the primary topic…. As a matter of fact, One of the most renowned judges the late Justice Elias was a Chief Justice in Nigeria was also the judge of the world court at The Hague …he received his law training in University College London. He contributed a great deal to the profession and gave us prestige in the foreign community. Like Ruky said, need to stop this backward thinking and vindictive witch hunts and focus on what REALLY matters! Well, legal diva other blacks agreed to sit at the back of the bus and drink from separate water fountains in the USA. The society is diverse and should be ALL inclusive within HARMLESS confines…..Many people just want to waste time arguing over a simple matter.